The Health Department has announced a 10 per cent hike in user charges for all the services being offered at the Doon Hospital (male and female). The city police today began its campaign to impound illegal liquor and penalise the owners of vehicles with tinted glasses. In its first such drive, the Dhara police post nabbed an auto driver, Guddu, for carrying 470 small bottles of desi liquor near the Clock Tower. A team of shopkeepers from Chakrata Road met vice-chairman, Mussoorie Dehradun Development Authority (MDDA), today to discuss their reservation regarding leaving two metres more space from the remaining part of the demolished shops on the road. The Uttarakhand Kranti Dal (D) is passing through a major upheaval for the last two days. Acting president of the party and head of the executive committee Luxman Singh Chufal is leading the group of dissidents in the party, who are not happy with the decision of party president and state Cabinet Minister Diwakar Bhatt to fight on BJP’s symbol in the Assembly elections. The election machinery in the state is keeping a strict vigil on the flow of liquor in the wake of the coming Assembly poll. Employees of the Excise and Prohibition Department are being kept busy round the clock having to tabulate the sale of liquor. With a large number of rebel candidates expected to be in fray in the Uttarakhand Assembly elections, the Uttarakhand Janmanch, a non-political organisation, has appealed to rebels from both Congress and BJP to come on a common platform and give people of Uttarakhand a viable political alternative. A brilliant hat-trick by Gopal Joshi helped the Bajrang Football Club trounce the Balaji Boys Football Club in the quarterfinal match of the Ram Bahadur Chhetri Memorial Football Tournament played at the Forest Research Institute (FRI) ground here today. The Punjab team entered the semifinal by defeating Khail Gao Allahabad and Himachal during the 26th Banke Lal Shah Memorial Under-15 Cricket Tournament played at the Rangers’ College ground here today. With the Congress yet to release its first list of candidates for the Uttarakhand Assembly polls, a series of demonstrations have already started taking place at the state Congress headquarters in Dehradun. After reports of denial of party ticket from Rajpur Road reserved Assembly constituency, supporters of former Sugarcane Development Minister Sadhuram today staged a demonstration at the Congress Bhawan. The mounting rebellion in the BJP has forced the central leadership to depute senior party leaders who have been instructed to pacify the party workers and supporters and stem rebellion that could spoil the party’s prospects in the coming Assembly elections. The first day of the filing of nominations received a lukewarm response with only a single Independent candidate Harpal Singh filing nominations from the Yamkeshwar Assembly seat. According to the Uttarakhand electoral office on the first day today, an Independent candidate filed his nominations from Yamkeshwar. On the other hand, in Dehradun district the candidates and their supporters showed interest in buying the nomination forms. As part of the New Year celebrations, the Gram Vikas Sanstha, Garhwal Colony, Nehru Gram, Dehradun, organised a cultural programme. President of the samiti Pan Singh Rawat said the samiti was organising such cultural programmes every year. He said the new community centre at Nehru Gram had helped the samiti get an excellent venue for hosting such programmes. Doon Star Football Club lifted the Amar Shaheed Kharag Bahadur Bisht memorial Football Tournament by defeated Vijay Cantt Football Club 2-0 in the final played at Nehru Gram here today. The patients availing themselves of treatment at the hospital will have to get used to paying more and the latest increase is in view of the decision of the department to undertake a yearly hike of 10 per cent. “The increase in the user charges for the services being offered at the hospital is in keeping with the inflationary trend being witnessed in the country,” said Dr BC Pathak, Principal Superintendent of the Doon Hospital. The hospital authorities have revised rates of the diagnostic tests, food, examination, etc, but for those falling in the BPL (below poverty line) category, the services will continue to be free of cost. 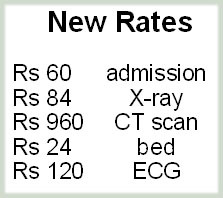 The new charges include Rs 60 for admission, Rs 84 for X-ray, Rs 960 for CT scan, Rs 24 as bed charges and Rs 120 as ECG charges. However, the hospital authorities maintained that the increase in charges of the diagnostic procedure, bed charges, operation, etc, continues to be cheaper than that those in private clinics and hospitals. The hike in the user charges, though minimal, is expected to make a substantial difference to the earnings of the government hospitals, grappling with an influx of patients on the one hand and the pressure to provide better facilities on the other. Under the campaign, any one found carrying objectionable items or arms in vehicles will be arrested. 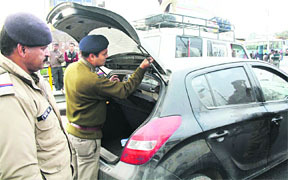 The use of dark films on windowpanes of vehicles has also been banned. Since a number of vehicles have tinted glasses they will now face a daunting task to remove the dark films all of a sudden. The tendency to serve liquor to voters also increases during elections. Seeing this police has swung into action to keep a vigilant eye on offenders. Senior Superintendent of Police GN Goswami said 10 surveillance teams, led by police officials, had been constituted to check suspicious vehicles, transportation of illegal liquor, etc, according to the directions of the Election Commission of India. The VC said he would clear the MDDA’s stand on the issue in two to three days. Meanwhile, all the 10 mobile towers stood tall over RGM Plaza and were not removed even today. The notices have already been served to the tower owners but they have not come forward in removing them. It is only the Plaza which remains to be demolished on the road as rest of the buildings have been cleared. Others whose shops have been demolished are angry at the authorities for sparing RGM Plaza and are airing their displeasure openly. The traffic, was, however, opened on the Chakrata Road as the debris has been removed from the road. The MDDA officials have prepared a new plan for the Chakrata Road, according to which the road will be made six lane instead of four lane as was proposed earlier. The road will be decorated with plants on both the sides and ample footpath area would be provided. Chufal is intending to break away from UKD (D) and fight in this election with the rebels. Chufal also belied the reports published in some newspapers that he was appeasing the incensed party workers to comply with Bhatt’s decision. He blamed party spokesperson Satish Semwal for distorting the facts before the media in his name. He awaits more resignations to come his way on Friday after which he is slated to jump into the electoral arena. On the other hand, other faction of UKD (P) did not open its cards for the second list of the candidates as was decided to be done today. He said party leaders were also engaged in assuaging the discontent among those who are likely to be displaced from the list to make room for outsiders. Sources in the department say that they are drawing day by day comparison of the sale of liquor from every licensed liquor vend vis a vis the sale that had taken last year. This is helping the election machinery analyse how much increase in the sale is being registered. If there is a dramatic increase in the comparative sale, this will lead to the inference that the liquor is being purchased and stored for distribution probably during the last few days of poll campaign. The department is also keeping a stringent watch over those purchasing the liquor in bulk. With the marriage season coinciding with the poll campaign, it needs to be clearly demarcated whether the liquor is being purchased in bulk to serve the wedding guests or someone else. It is a well-known fact that in the past elections, some of the candidates had resorted to luring the voters with distribution of free liquor. It has been seen in the past that liquor plays a role even in the smallest of elections that take place. It is to curb this menace that the Election Commission has adopted stringent measures. Although there are teams to carry out raids in case there is any information of storage of liquor, the irony remains that the personnel of the department are woefully short of manpower and paraphernalia. Sources in the department related that there were very few hands available for carrying out the routine jobs what to talk of carrying out specific operations. Then there is a shortage of vehicles and also of arms to tackle a situation where there might be armed resistance from the guilty. The officials do not dispute the effectiveness of the plan chalked out to check the menace but at the same time they point out to the various shortcomings which need to be addressed by the administration. The Uttarakhand Janmanch that had been quite vocal over the corruption issue in the state today issued an appeal to both Congress and BJP rebel candidates and other intelligentsia to join the Janmanch. Uttarakhand Janmanch secretary Rajen Todariya disclosed that the Janmanch had taken an initiative to bring all rebels on a common platform for the betterment of politics of Uttarakhand that had been marred with the rampant corruption. He said both Congress and BJP had never believed in democracy and asserted that neither there was internal democracy in both these two parties, nor they were committed to the development of the state. Todariya said some MLAs and certain former ministers were already in touch with him and had welcomed the Janmanch’s efforts. He said literary personalities, artists and others social workers in the state had also strongly favoured for providing a non-Congress, non-BJP alternative to the people. He said the Janmanch would also be convening a conference of intelligentsia in Uttarakhand for forming a popular opinion linked to the Assembly elections in the state. Todariya said the good people must come forward to become opinion makers and free Uttarakhand from corrupt politicians of the national parties. Both teams were locked in an even battle when Gopal Joshi scored the first goal for his team in the 40th minute. He scored his second and third goals in the 50th and 52nd minutes, respectively. Later, Rahul Kainthola scored the fourth goal in the 55th minute and Anuj scored the fifth goal in the 58th minute of the game. In the second quarterfinal match, Garhwal Sportings beat Chanderbani XI 6-5 to enter the semifinal stage of the tournament. Both teams remained locked at 1-1 during the stipulated time. Vikaran Rana scored the first goal for Garhwal Sportings in the 51st minute but Chanderbani Xi equalized through Deepak in the 55th minute. 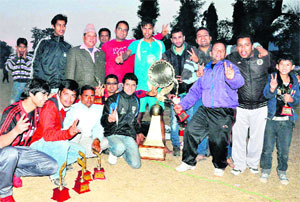 In the tie-breaker, Garhwal Sportings scored all five penalties while Chanderbani XI missed a goal to lose the match 6-5. Abhishek, Vikaram Rana, Naveen, Sumit and Pankaj scored for Garhwal Sportings while Mohit, Deepak, Shubham and Anuj scored for Chanderbani XI. The Bajrang Football Club and Garhwal Sportings reached the semifinal of the tournament. Wills Youth Club will take on Nagar Nigam Football Club while Doon Star Club will clash with Doon United Club in tomorrow’s matches. In the first match, the Punjab team defeated Khail Gao Allahabad by 7 wickets. After winning the toss, Punjab chose to bowl first. Khail Gao made a total of 60 runs all out. Rohit Pandey and Aalok were the highest scorers for the team with 13 and 12 runs, respectively. 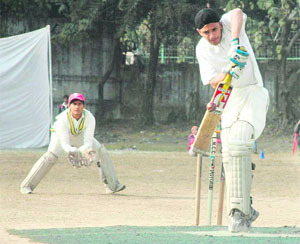 Sukhpreet took three wickets for 12 runs. In reply, the Punjab team scored 62 runs at the loss of three wickets to win the match. Opener Abhinav scored 34 runs while Marshal also contributed to steer their team to victory with 11 runs. 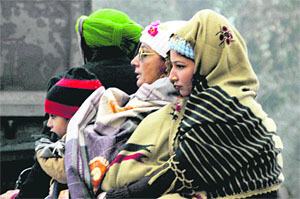 Meanwhile, in the second match, Punjab beat Himachal by 20 runs. Punjab won the toss and elected to bat first. They made a total score of 140 runs. Abhinav scored 56 runs in 54 balls and was the highest scorer for the winning team while Marshal remained the second highest scorer with 39 runs in 30 balls. Responding to the first innings score, Himachal fell short of the target by 20 runs and lost the match with a total score of 120 runs. Lakshay and Sahil were the highest scorers for the team with 32 and 20 runs, respectively. With the Congress yet to release its first list of candidates for the Uttarakhand Assembly polls, a series of demonstrations have already started taking place at the state Congress headquarters in Dehradun. After reports of denial of party ticket from Rajpur Road reserved Assembly constituency, supporters of former Sugarcane Development Minister Sadhuram today staged a demonstration at the Congress Bhawan. The protesters, who sought party ticket for Sadhuram from Rajpur Road Assembly seat, also threatened to go to any extent if the former minister was denied the ticket. Among other prominent protesters included supporters of former Congress Minister Hira Singh Bisht, who reached Congress Bhawan in big numbers. 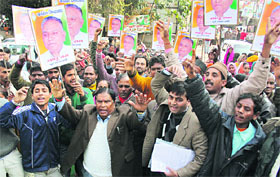 Congress Minister Hira Singh Bisht’s supporters sought ticket for Bisht from the Raipur constituency. They said Bisht was the most potential candidate to give a contest to BJP candidate and minister Trivendra Singh Rawat. Meanwhile, reports reaching Dehradun indicate that Congress high command in Delhi could release its first list of candidates either late in the night or tomorrow. Party senior leaders, vice-chairman, State Planning Commission, Manohar Kant Dhyani, Murat Ram Sharma and Naresh Bansal have been asked to get in touch with the rebels to defuse the revolt. Today the supporters of S.M. Zaidi also staged a protest against the party’s decision to give the party ticket to Kalim Ansari from Mangalore. In Devprayag district, the party has deputed leaders to take the lid off the simmering discontent prevailing in the BJP after the resignation of Mahipal Butola, who has decided to fight the elections as an Independent candidate.“This is a temporary phase; the things are bound to settle down after some time and the party workers would work for the BJP in the elections,” said Manohar Kant Dhyani. The first day of the filing of nominations received a lukewarm response with only a single Independent candidate Harpal Singh filing nominations from the Yamkeshwar Assembly seat. According to the Uttarakhand electoral office on the first day today, an Independent candidate filed his nominations from Yamkeshwar. On the other hand, in Dehradun district the candidates and their supporters showed interest in buying the nomination forms. Prominent among them include Rajni Rawat and BJP candidate Ganesh Joshi, who is the BJP candidate from Mussoorie Assembly seat. The last date of filing nominations is January 12. Garhwali, Jaunsari and Kumaoni folk dances were the highlights of the cultural programme. The audience in particular appreciated the presentations given by child artistes. Anjali Dhondiyal gave a Kathak presentation whereas Virendra Bhardwaj showed his excellence in guitar. Meenakshi Rawat sang a Garhwal Song. Vikram Singh Negi, secretary, Gram Vikas Sanstha, CM Bijalwan, treasurer, and L K Kandpal were prominent sanstha office-bearers present on the occasion. Doon Star Players played an attacking game and scored the first goal in 23rd minute through Vijay. Two minutes later, Dharam Singh increased the lead by scoring the second goal. Vijay Cantt players tried hard to score goal but could not succeed till the final whistle. Madhur of Vijay Cantt was adjudged the man of the match while Abhishek of Doon Star was given the man of the series award. The fair play award went to Balaji Boys team. Kuldeep Butola, chairman of the District Cooperative bank distributed the prizes.